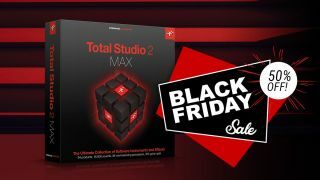 IK Multimedia's huge bundle of software, Total Studio 2 Max, is now 50% this Black Friday and Cyber Monday. Featuring 94 products and 16,800 sounds in synths, effects and processing tools from the likes of Syntronik, SampleTank, T-RackS, Lurssen Mastering Console and Miroslav Philharmonik 2, Total Max 2 looks like it has something for everyone. Prices for the discounted, epic collection start at $124.99/€149.99 for the upgrade from version 1, rising all the way up to $499.99/€599.99. Of course this is not the only deal to be had from IK Multimedia this holiday, with more products given the half-price treatment.